Learn how to make a straw bag with this free knitting pattern. 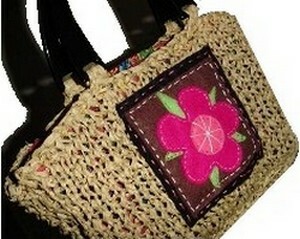 The last straw bag? Knitting straw bags is becoming a lost art – and yet our grandmothers wouldn’t be without a sturdy, practical straw tote when shopping. Make your own attractive straw tote bag with this pattern – and forego the plastic bags that they give you at the store in favour of your own bag made from a renewable resource. Finished size is 11″ wide x 7″ long. » slightly tilt the position of the star)Sew Green Star to Brown Square with Violet Embroidery Floss. » Sew Pink Circle to the center of Fuschia Flower with the Violet Embroidery Floss. » * Sew Entire Applique onto the center of the front panel with 5 Strands of Pink Floss.